Our premier line of Window Boxes and Planters are made with an innovative product known as Cellular PVC that will not rot or mildew. Flower boxes in this collection look just like wood - however, unlike natural wood, these rot-proof PVC composite window boxes are made to offer a lifetime of maintenance-free flower box enjoyment. Hooks and Lattice manufactures the largest selection of rot-proof PVC Window Boxes, all hand-cut and assembled by dedicated craftsmen. Like a plastic window planter, these plant containers will not split, cup, rot, warp or twist. However, the handmade component offers a combination of uniformity, beauty and durability superior to the usual plastic window boxes. 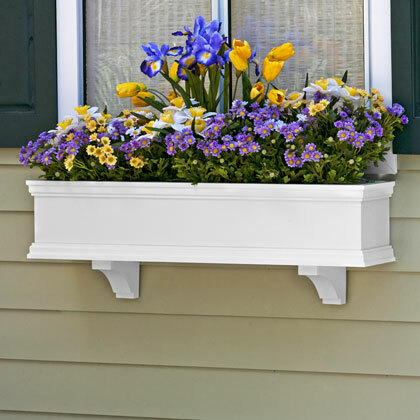 Each of our Composite Window Boxes and planters come in standard white that is easily painted. Custom window boxes in any custom length are also available for quote over the phone with a friendly, live representative. Composite PVC Window Boxes, are made using a solid core cellular PVC material that is impervious to water and moisture. In this collection from Hooks & Lattice, each PVC Window Box is carefully hand-crafted for quality and superior performance. Break free from the confines of the cheap plastic window boxes and enlist a product that is superior in material quality and construction. Direct mount window boxes are a familiar installation type to most, in that, they bolt straight through the back of the box, directly into wall studs. This is the most secure way to mount boxes in high traffic areas where theft or vandalism might be an issue. The direct mount construction is also ideal for deck rails. Pair any direct mount flower box with shelf-style railing brackets and plant privacy plants like boxwood, ivy or ferns to hide unsightly balcony views or create a more intimate space on your patio. PVC railing planters increase curb appeal and beautiful outdoor spaces. Click Here to read more about installing direct mount composite boxes. Cleat Mount constructed flower boxes were developed as a solution for gardeners who are looking for the fastest and easiest method of installation. A channel is built into the back of the box that fits its (included) counterpart, the cleat itself. Just bolt the cleat strip to the wall and "clip" the window box onto it securely. It's easy on, easy off with these flower box planters, making changing out seasonal plantings a snap. Winter, Spring, Summer and Fall window box ideas and growing recommendations can be found on our blog, as well at our window box photo gallery, and you can learn about installing boxes with cleats in our Resources section. Extral Large (XL) Cleat Mount boxes work exactly the same as the aforementioned cleat installations, but they are a bit more roomy. We increased the width and heigh of these containers to give landscapers maximum planting space. This is great for placement in warmer locations, as the soil will retain moisture longer, and you have more flexibility to grow larger species of plants. Direct, cleat and XL cleat mount window box planters all have pre-drilled holes for drainage; bolts and railing brackets are sold separately in our Brackets and Bolts section. Add faux brackets to any for sophisticated curb appeal, giving your house noticeable appeal and increasing your home's value. Nothing Compares to Hooks and Lattice Quality. Hooks and Lattice PVC flower boxes outperform other standard plastic window planter styles in construction and durability. When you buy from us, you know each container was individually made by a dedicated craftsman, unlike other plastic window boxes that are mass produced with little attention to detail. An our solid-core cellular PVC composite will stand the test of time when other planters fail. While you will certainly find other variations of plastic window boxes online, realize the perks of purchasing a heavy duty container from Hooks and Lattice over any other brand. Not only do our PVC Window Boxes provide a planting container that is impervious to water and resist rotting, but insects completely ignore the material as a possible nesting option. Nothing Compares to Hooks and Lattice Service. In addition to constantly striving to bring you new an innovative home and garden products, Hooks and Lattice proudly staffs an elite customer service team, ready to help you over the phone, by email, or online chat. Whether you aren't sure about which window box size is best for you, or simply have questions about ways to add more curb appeal to your home, we're here to help you with your project every step of the way. Our team in San Diego is standing by Monday-Friday, 7am-5pm PT. It's easy to increase your home's curb appeal with Hooks and Lattice window boxes, planters, exterior shutters and hanging baskets. Dress upper and lower levels with window box planters, then flank doors and pathways with coordinating outdoor planters. Hanging basket planters look beautiful near front and garage doors, on shepherd's hooks or mounted using a decorative wall bracket to the house or to a 4x4 post anywhere in the yard. The ultimate, and most high-impact curb appeal element is our Faux Balconies for windows and doors. Browse conveniently online to explore your options. When you buy PVC Window Boxes from Hooks and Lattice, you can be confident you are receiving the highest quality product at the best possible price. For volume disounts and information on styles, sizes or to get a quote for custom PVC Window Boxes, contact one of our window box specialists toll free at 1-800-896-0978, 7am-5pm PT, M-F.